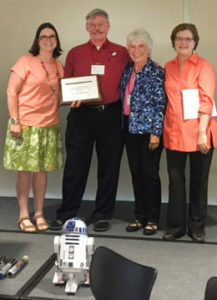 PULLMAN, Wash. – Washington State University animal sciences professor John McNamara is the inaugural recipient of the Jane Parker Award for Service to the WSU Advising Community, presented recently by WSU ACADA (Academic Advising Association). “This award is newly created to honor individuals who have been in the forefront of, and are strong supporters of, academic advising, and it is very fitting that the first Jane Parker award go to Dr. McNamara,” said Valorie Fisher, president of WSU ACADA. The award honors Jane Parker, a nationally recognized advising professional who retired in 2012 following 36 years at WSU. Throughout her career, she led advising programs, coordinated student peer advisors and worked with reinstated students. She became assistant director of the former Center for Advising and Career Development at WSU. “Jane championed the value and importance of advising to student success,” said Fisher. Brooke Whiting, left, John McNamara, Jane Parker and Valorie Fisher. “The Jane Parker award is WSU ACADA’s top honor for contributions to advising at our university, and the executive committee voted unanimously to honor Dr. McNamara with this award,” said Brooke Whiting, chair of the group’s awards committee. “In his 33 years at WSU, he has been an award-winning teacher and a tireless advocate for excellence in advising of students,” Fisher said. “He is passionate about helping them reach their goals, and he often lifts them up and shows them where they could be with hard work and determination on the path to graduation. McNamara is retiring from WSU. Just days after landing the Jane Parker award, he received another high honor: he was elected to be a fellow of the American Association of Animal Sciences. A fellow in the American Dairy Science Association since 2012, he is the ninth person to be a fellow in both professional societies, Whiting said. At WSU, he was one of the first recipients of excellence in research and advising awards from the College of Agricultural, Human and Natural Resource Sciences and an early member of the WSU Teaching Academy. WSU ACADA is the primary organized group of professional and faculty advisors and student support personnel at WSU. It offers numerous workshops and trainings and facilitates relationships between mentors and mentees. Membership provides access to resources available from NACADA: The Global Community for Academic Advising. Learn more at http://www.wsuacada.org.